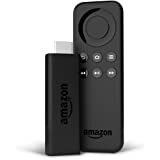 Sold by 9 ABS CORPORATION and Fulfilled by Amazon. Gift-wrap available. 100% AIRTIGHT AND LEAKPROOF GUARANTEE: Our Glass Meal Prep Food Storage Containers are perfected with Smartest Snap Locking Lid System that ensure your meal is completely airtight and 100% Leakproof. The smart lid is white clear flat, with NO VENT and NO HOLE. Fill it up with liquid, turn it upside down and even shake it. You’ll be amazed to see that it’s completely leakproof. Finally no more food spilling over again. They also look very pretty and premium quality compare to other containers. 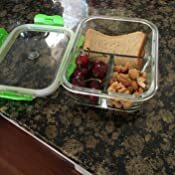 MULTI PURPOSE GLASS FOOD STORAGE CONTAINERS: Save time and money. Prep your meals from home, save them in fridge, then bring them to office or anywhere you go. 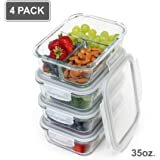 It’s also perfect for Food Storage Containers and Leftover Food Containers. Any Special Event coming up and need to prepare more food? Use these to organise and store more food in the fridge. 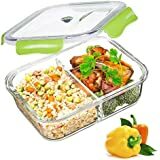 Our Glass Food Containers are also Microwavable (Microwave Safe), so you can warm up the food and enjoy them without needing an extra container. 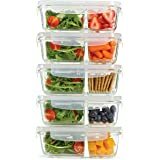 SMARTER HEALTHIER ALTERNATIVE THAN PLASTIC: Our Glass Food Storage Containers are made of Premium BOROSILICATE GLASS, which is the strongest, much thicker, sturdy, heavy duty and very durable. It is not plastic, non-toxic, not releasing chemical, transparent, clear, lightweight, easy to carry, easy to clean, no stain, no smell and BPA FREE. It’s a smart reusable food storage container solution. They're also freezer safe, fridge safe, microwave safe and dishwasher safe. FDA and LFGB Approved. REUSABLE LUNCH CONTAINERS It’s a good size for individual lunch. It’s not bulky or heavy. It's lightweight and easy to carry. If you need more food, simply bring 2 or 3 containers. These can be a nice gift as well. 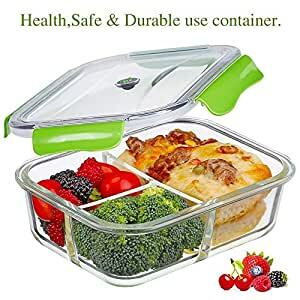 Purchase this beautiful airtight food container as a gift for family and friends. They will use it and thank you for it. GUARANTEED PRODUCT Give our product a try. 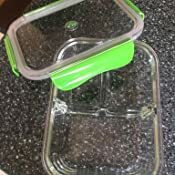 We use these glass meal prep food storage containers in our own kitchen. We love them a lot. We use it to bring lunch. We use it as food storage container and leftover food container in the fridge. We’re very confident to recommend these to our own family and friends. If you’re not happy with these containers, simply let us know and we’ll arrange for your money back. Click Add To Cart now and get it to your home soon.